Under the right conditions, rabbits can develop stones within the urinary tract. The stones are caused by the accumulation of mineral deposits. This condition is called urolithiasis. Urolithiasis can occur in any of the organs of the urinary system. Small stones can be removed by flushing the urinary system while the rabbit is under anesthesia. However, it is necessary to remove large stones surgically. Rabbits normally excrete extra calcium provided in the diet through their urine unlike humans, dogs, and cats which excrete excess calcium through the stool. Rabbit diets high in calcium may be a reason for the cloudy look of urine, but it is not to be blamed entirely for the development of kidney stones or bladder sludge, material that is not yet a mature stone. Long-term water deprivation, urinary tract infection, and genetic factors all contribute to the formation of bladder stones. Any blockage of the bladder or urethra must receive immediate medical attention, as this can represent a life-threatening emergency. Many times inpatient care is necessary until the rabbit can urinate freely on its own. Such treatment can include surgical removal of urinary obstructions, proper fluid balance, and antibiotic treatment. Large bladder stones are usually removed surgically, while smaller stones and sludge can be flushed out while the rabbit is under anesthesia. •	Always supply fresh water. 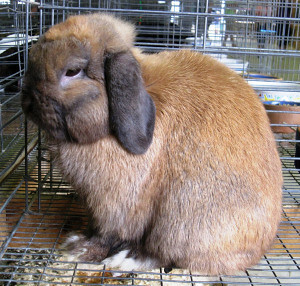 Rabbits must always be supplied with clean water that is free of dirt, grass, and other impurities. Water should be changed every day. Proper fluid intake helps to dilute urinary waste products and can decrease the risk of an infection. Owners should also inspect watering bottles to make sure they work properly and are free from algae buildup which can restrict the flow of water when your rabbit attempts to drink. •	Provide your rabbit with a moisture-rich diet. Foods high in moisture will add water to its system and will help prevent thick highly concentrated urine that can easily lead to urinary tract infections. •	Reduce dietary calcium. Alfalfa hay, which is also used in the formulation of rabbit pellets, is high in calcium. Providing your rabbit with a high-quality grass or timothy hay will help to prevent the ingestion of excess calcium. •	Clean your rabbit’s toilet area regularly. A clean toilet area encourages your rabbit to urinate. Regular urination prevents urinary contents from backing up. Rabbits that have soiled toilet areas may retain urine for longer periods of time. •	Exercise your rabbit. Rabbits need time to move freely. Normal movement promotes regular urination and also provides time for rabbits and owners to bond.